GoWiWi is a very expensive strategy to use, however it is extremely effective. It is comprised of (Go)lems, (Wi)zards, and (Wi)tches. This is the number one strategy used for pushing through Master into Champion. The whole premise is to use your golems to shield your witches and wizards, so they can wreck massive damage! Step One: Find a good base to attack. Make sure they have at least +24 trophies, since you are spending lots of Dark Elixir and time on this army. Once you find a good base, make sure their mortars aren’t off to the side and will target your wizards/witches. Also try to find a base with relatively weak walls. If they are too strong your golems will be sitting ducks. Step Two: Place your golems in a line against one side of the base. Drop rage spells on your golems and send in your wall breakers. After the wall breakers have exploded, drop your witches and wizards behind the golems. The golems will take all the fire, while your “Wis” stay behind and wreck the non-defenses. Step Three: If you are attacking a TH10, as soon as the Inferno Towers start firing, drop a freeze spell on those infernos. (if you are TH9, drop rage spells on your golems again)After that disappears drop your other one. This will prevent your golems from being turned into Golemites quickly. 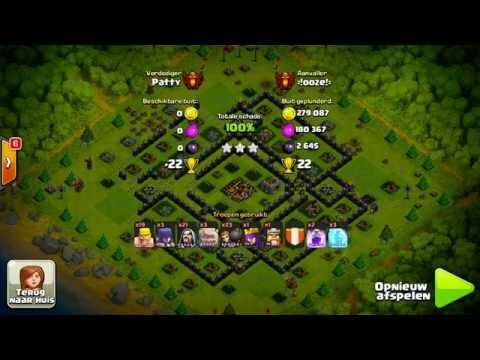 If you are attacking a Town Hall 9 then just use your rage spells when needed. Step Four: After you have destroyed 40%-50% of the base, send in your heroes as close to the Town Hall as you can. If your troops are almost dead, use your heroes’ special abilities to destroy the Town Hall. If you are close to a 3-star, drop them where there are still a lot of buildings left. Step Five: Celebrate! You have just earn yourself 16+ stars for your push to Champion. Train all your troops again and repeat your great raid! I hope you guys enjoyed this guide. GoWiWi is a very effective strategy. Use it well!